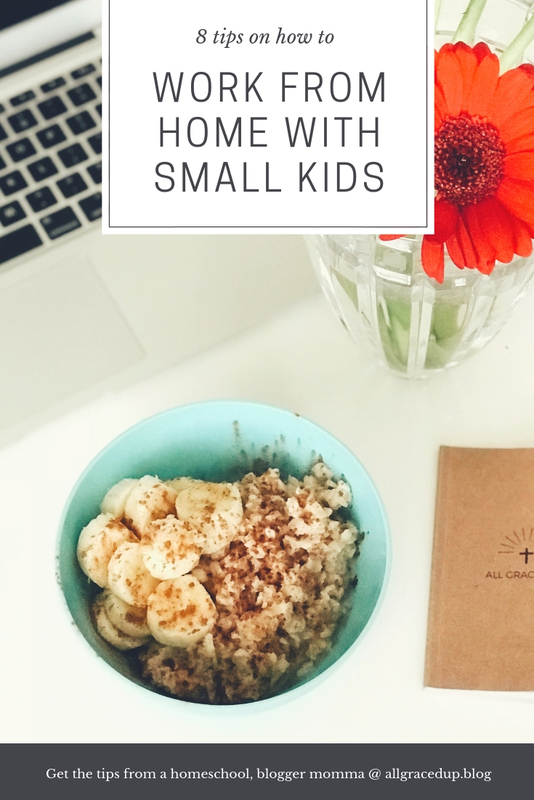 I’m excited to share with you 8 tips that may help working from home with small kids easier! As a busy mom blogger & homeschool momma, it can be challenging, but it’s not impossible! I encourage you to share your tips in the comments below! It's nearly 5 am & as I write this I hear kiddos tossing in their beds, the smell of hot coffee seeps into my tummy & white noise is blaring like we're at a baby rock concert. This is it, this is life as a blogger momma to small kids. This is the life I was blessed with, the life I chose & the purpose I believe I was chosen to fulfill. My kids are 2, 4, & 6 so you can say I've reached that stage where my kiddos can play independently for longer periods of time. But we still have our 'days' & our 'moments'. Throw in sickness or growing pains & things usually have to stop dead in their tracks. I'm not going to lie, some days I'm successful at keeping my kids occupied, paired with a side of accomplishment & other days I absolutely loose my mind. Yup, like have no idea where it went. Like I have to go searching in the laundry basket for it kind of days. I usually end up finding it in the freezer near my stash of frozen, Trader Joe's dark chocolate peanut butter cups. Ha! Either way, we're learning to celebrate in the good and celebrate through the chaos. Not only am I a blogger, I'm a homeschool mom. Yes, you heard that right, I basically love self-inflicted chaos. But the truth is I love blogging. And I love homeschool. What I have to say no to is everything else. I'll share more about that in this post. When the kids wake up, we do homeschool. I love homeschool because I get to connect with them & they get to learn. After homeschool we usually go to the park. After the park, we either run an errand or come home for nap & quiet time. During these couple of hours is when I'll either work on our budget & pay some bills, work on social media or do whatever else needs to get done as far as administration tasks go. This schedule is ideal & may vary from day to day. We also have to take breaks because my kids @ their ages get cold & hungry & aren't able to fend for themselves. They're getting better at it, but they still need help. So in an effort to 'avoid chaos' (for lack of better words), I MUST.TAKE.BREAKS. #2. Eat well & don’t forget to drink lots of water. I'm kind of going in reverse & here's why. You'll realize in hindsight why things didn't go as well as you'd hoped. Waking up at 4am to write is no easy task, maybe soothing & enjoyable (cause peace & quiet), but not easy. By about noon you'll start to feel a slump. By 3, you'll start to feel grouchy & irritable. Some of these side effects of waking up early & taking care of kids all day can be avoided by proper nutrition & LOTS of water. Notice I said some side effects, 'cause #momlife. You'll feel better all around if you eat small meals & snacks & drink lots of water, throughout the day. I think this is an important reminder because I’m often feeding the kids & neglecting the fact that I need brain food too. So eating well & drinking lots of water sets a good example for the whole family! #3. Rewards the kiddos for listening well & letting you work. Hold on, I hear something. My kids are actually playing nice together! (in an ideal situation) Do I stop & say something? Yes, of course, I tell myself!! My kids are so often being told what not to do & the behavior that isn't accepted in this house. It's extremely important that they understand what ideal behavior looks like. Cleaning up after themselves, playing nicely, initiating new activities for themselves, all account for rewards (in my opinion). Sometimes that can be a high five & 'great job!'. Or sometimes it means sundaes for lunch. We enjoy going to Trader Joe's & picking our own treat but whatever you decide, is up to you. #4. Wake up early or go to bed later. I'm pretty sure it was Christy Wright that said, "Don't dread the sacrifice, anticipate the reward.". Maybe not in those exact words, but I think I heard it off of one of her podcasts. When deciding to set your alarm for 4am it's easy to think about what the day might look like; a miserable mom that's dead tired. Instead, think about how accomplished that dead tired mama will feel if she wakes up early & finishes something that the kids can't touch (a blog post, a few e-mails, the family's budget, etc). I think it's important to start the day with a devotional too. Doing this sets the precedence in my heart & helps me stay grounded throughout the day. Some of us are early birds & some of us are night owls, choose what works for you & go with it. I get it, a rested mama is a more peaceful mama, I usually choose to wake up super early a couple of days a week, usually the days my blogs go live. Homeschooling has allowed us to have flexible schedules & sometimes I get to sleep in, yay! Sleeping in around here is between 6 & 7 'cause #momlife. #6. Ask for help, get help, seek help! Whether it's youtube science videos, (don't you know that Ryan's toy review has science videos?!) grandma, or Play-Doh, use whatever works to buy yourself an hour or two. I let my husband clean the restrooms last weekend & that was huge for me! I often look at help as a hit to my ‘do it all’ mentality. But accepting help is actually a great quality to have! My mom loves coming to play with my kids & I always try to make sure I have work lined up for when she gets here. This is definitely a preaching to the choir bullet point. The way I'm determining what my best yes is, is when I ask myself what God's will is for my life. If it's not clear to me, I try to pray & read His word. I can't tell you how many times I've said yes to something out of guilt & had to say no to peace of mind. But, I also cannot tell you how many time I was absolutely conflicted & found peace & understanding through scripture & prayer. I've even read devotions that spoke right to the heart of the issue I had been having. It's amazing what I find when I search for Him with all of my heart. Another thing that helps me to say no is to remind myself just how quickly this season passes. I feel as though writing, for me, is a form of therapy. I also feel that if I'm if I'm over scheduled & not cared for then they aren't cared for. I want to look back on this delicate, sacrificial season & think not only did I survive, I thrived because I said my best yes. I think it’s also important to embrace community & finding your standard of balancing work, family & faith is important. In the end, God chose me for these kids & you for yours. Chosen, for this mom job! I pray we can see the refiner's fire of motherhood as a testimony! Of His faithfulness, love & compassion. Most of the time I feel less than perfect & under qualified to do what God's put on my heart, to be a homeschool mom and a writer. 2 Corinthians 12:9 says that His grace is sufficient for me, therefore I will boast all the the more gladly about my weaknesses so the power of Christ can rest upon me. THIS scripture. This scripture says no, I'm not qualified. Yes, I'm imperfect. But it's in those imperfections that I can allow his power to rest on me. Motherhood has been the desire of my heart for as long as I can remember. Being a mom blogger, another desire of my heart. He's our father & I truly believe He wants to help us fulfill the desires of our hearts. Whether you've decided to work outside of the home (been there! ), cater to your babes 100% of the time (been there too!) or become a #momprenuer , the only right answer is what's best for you & your family! My hope & prayer is that you & I can find 'happy' right where we're at. So grace. Grace to start, grace to keep going & grace to finish the race. Speaking of grace, this devotional is everything! Here's another post I wrote on 'surviving with toddlers', here. I found another mom's toddler activity ideas, here. Find out how we deal with picky eaters & get our kids invovled in the kitchen, here. I talk more on busy mom blogger life here. Here you can find 9 staples that every busy momma MUST have! I share my best busy momma health tips here. Be encouraged as a momprenuer & become business savvy, by reading this book! Best work-from-home high waisted black leggings! Best work from home grab & go shoes! Best work from home bras! For the preschoolers! We have this & the kids love it! This toy has now been through all 3 of my kids & keeps the littles busy! I’d love to connect with you more on Instagram!